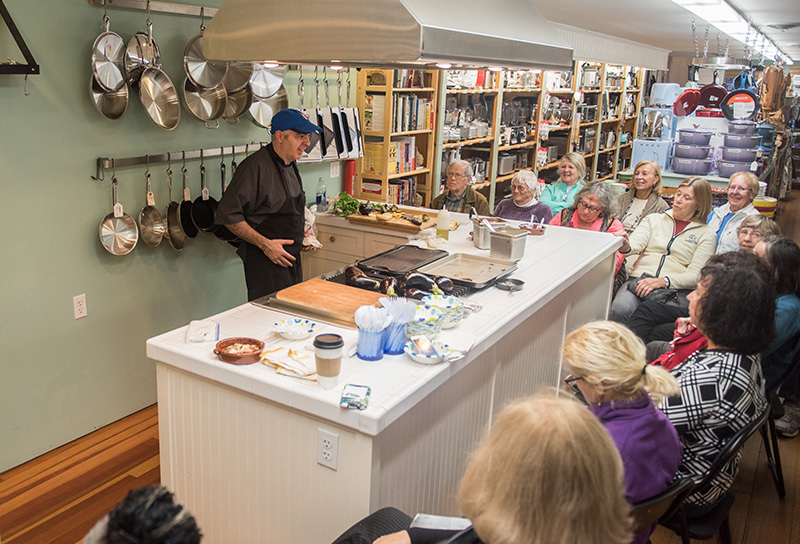 La Soffitta Chef Salvatore Della Torre leads cooking demonstration at LeRoux at Home. You would have to have a really bad ear for accents not to immediately recognize that Chef Salvatore Della Torre is Italiano, as he kiddingly tells some 20 of us gathered around the small demonstration kitchen tucked away in LeRoux at Home, which hosted a cooking demonstration and tasting last week. 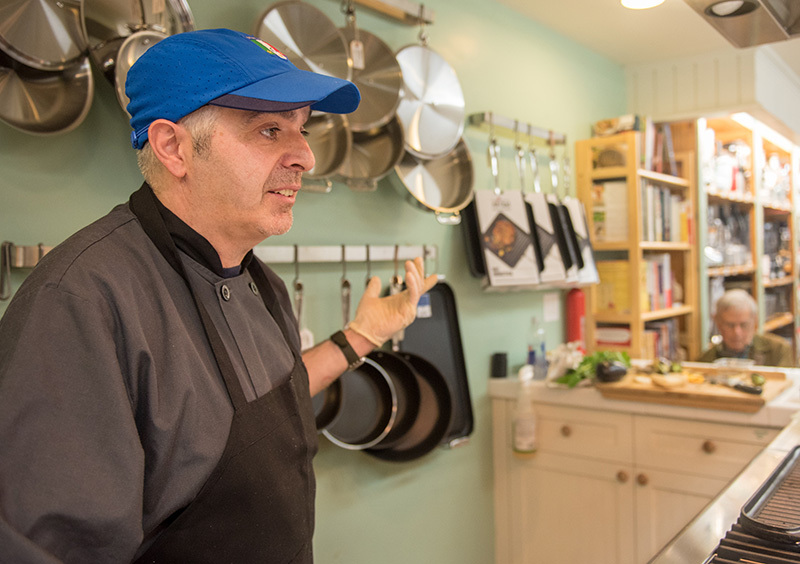 A disclaimer upfront: There is no way to readily convey Salvatore’s authentically warm and humorous manner, enhanced by his expressive language and accompanying gestures that underscore his passion for cooking and for educating others about healthy ways to make delicious food. You can tell it’s a way of life for him, not just how he makes a living. 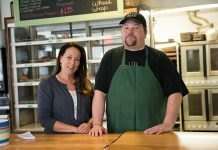 He’s chef at La Soffitta Italian restaurant in Vineyard Haven. Our session focused on the humble eggplant, a vegetable that not everyone readily embraces. But I guarantee you, Salvatore’s class would have changed your mind, or reinforced your love for it. 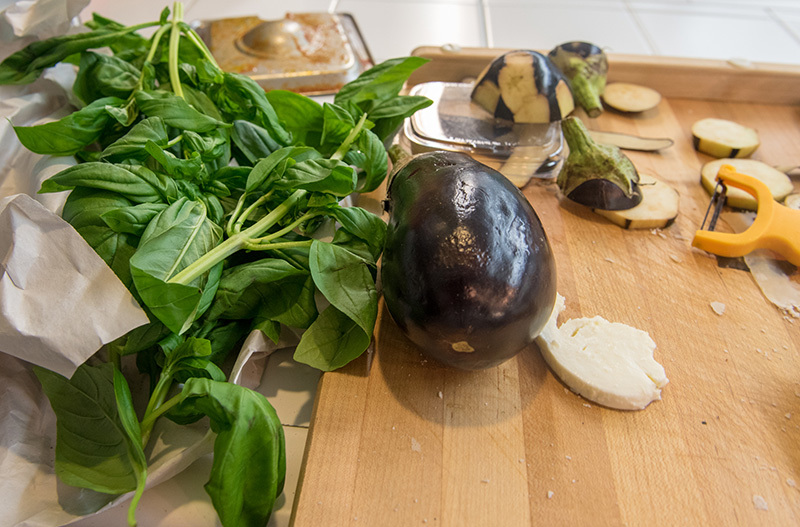 He told us he would be preparing eggplant Parmigiano Reggiano, but his delicate, quickly assembled and cooked version had nothing to do with those baking dishes of oozing cheese and marinara sauce drowning out the underlying eggplant. He told us he was going to teach us a simple, easy way to make eggplant Parmigiano Reggiano, and he was right. From our vantage point we could see that Salvatore had assembled before him a handful of high-quality, fresh ingredients: eggplants, basil that he would later slice into thin strips, a small bowl of homemade tomato sauce, sea salt and a pepper mill, a bottle of extra-virgin olive oil, and not just any ol’ cheese, but Parmigiano Reggiano in particular. More about that in a moment. He started, logically, with the eggplant, which he insists must be of the best quality and worth paying just a little more for. 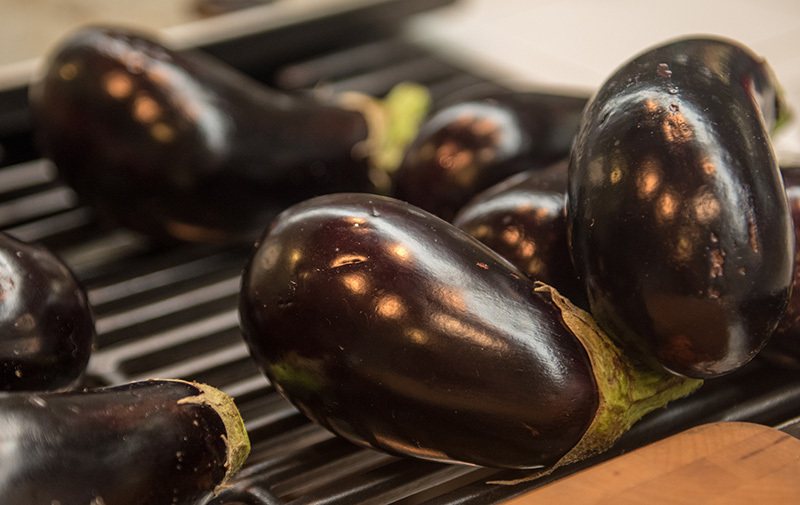 He used smaller eggplants because the larger ones have too much water, thus taking a longer time to cook. Not everyone likes the eggplant with its skin on, while others insist on it, so Salvatore shows us an easy solution. He holds the small purple majesty vertically in his hand and while turning it, makes a pinstripe pattern by leaving a strip of skin on and then the next strip peeled off, repeating this pattern all the way around. It’s a quite attractive solution to please everyone’s palate. 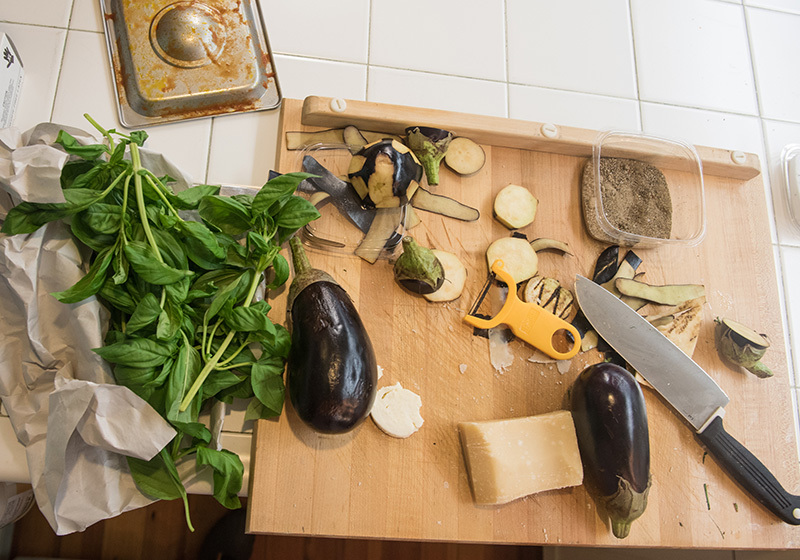 After slicing off eight thin rounds, he showed us two ways to prepare the eggplant. He doesn’t flour and/or fry them, as some recipes call for. 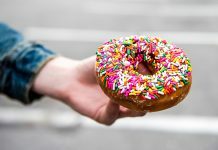 He just placed four rounds on a baking sheet lightly coated with extra-virgin olive oil, sliding them into a 425° oven for 10 to 15 minutes and turning them over about halfway through, until they got slightly crispy on both sides. The remaining four slices he brushed lightly with the extra-virgin olive oil and arranged on a small grill, turning them as they quickly cooked through, which also gave them that luscious black-line grill pattern. Both versions then went into small ramekins, but you can improvise with any small baking dish, or on a baking sheet, as long as you fit the rounds snugly together. Next he spooned on just enough tomato sauce to cover each piece of eggplant. Salvatore spoke emphatically about the absolute necessity of always using seedless tomatoes in your sauce. He explains that the seeds will ferment the tomatoes, thus making them bitter. Squeeze or strain the seeds out, or buy preseeded tomatoes at the store. Ideally, of course, Salvatore hopes you’re growing your own red gems to use. Now to the cheese. As he grates it on top, he gives us the lowdown on the specific Parmesan to use. When you think of Parmesan cheese, does the ground pour-on kind in the green container pop to mind? Salvatore would have your head if you used this, which to him doesn’t even rank as Parmesan. He hefts a dense chunk of what he calls the best and only authentic Parmesan to use, Parmigiano Reggiano, so called for the area in Italy from which it comes. Salvatore emphasized that it’s been aged for 24 months. He gave us each a slice, and it had a savory depth and texture like none other I’ve ever tasted. He spoke too about the difference between the goat’s-milk version, which is more dense than the kind made with cow’s milk, which retains more water. Generally, he prefers the goat’s-milk Parmigiano Reggiano for this dish, and lightly grated each eggplant round with a delicate coating of nearly translucent curls. 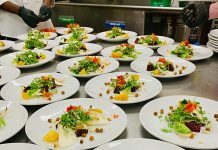 He added just a touch of sea salt and ground pepper on top before sprinkling on the thinly cut basil, emphasizing the herb must be “Fresh! All the time fresh with my work. Don’t use any dried.” Like the tomatoes, the basil came from his beloved indoor garden; he uses its bounty both at La Soffitta and at home. He finally popped both ramekins into the oven to heat through and allow the cheese to melt. 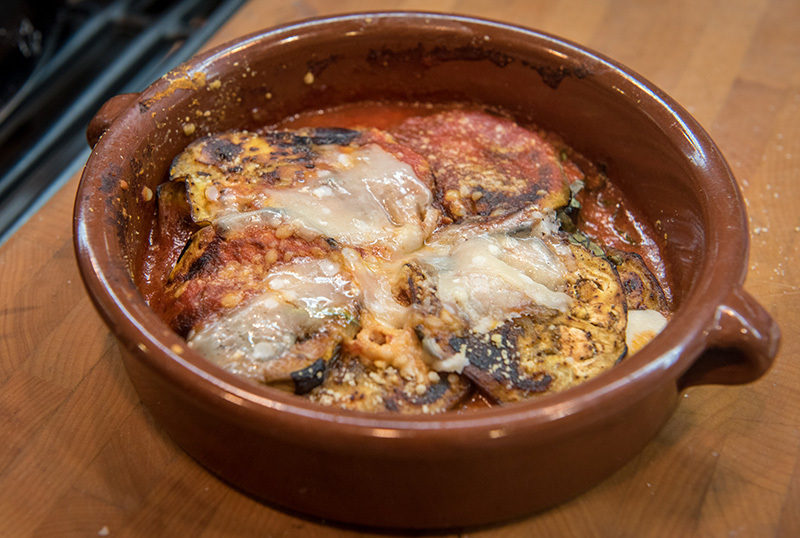 In yet another version of this dish, he topped each eggplant with a slice of mozzarella before the final heating. Throughout the demonstration, Salvatore rattled off additional easy ways to make eggplant. The one I will try is vertically halving a small eggplant, scooping out the centers, leaving only about ¼ inch of the inside “meat” to the skin. He said to fill the “pockets” with garlic, tomato, little black olives, and grated Parmigiano Reggiano, and bake for 4 or more minutes at 425° until cooked through, remove, and sprinkle with capers. He asks us if for the next demonstration we would like to learn how to make fresh pasta, which he says is his recipe, but we here on the Vineyard are a community, so he wants to share it. Keep an eye out for the announcement. 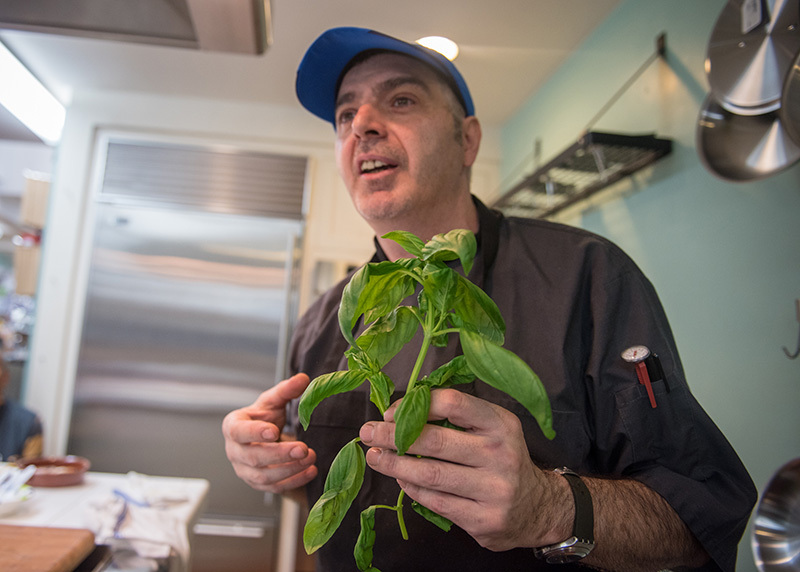 Salvatore Della Torre is chef at La Soffitta on 82 Main St. in Vineyard Haven. Visit the website for more information: lasoffitta.com. Note: Salvatore does not use measurements, having learned at his grandmother’s knee. Follow the basic recipe, adapting it to whatever suits you best. Remove slices and arrange them in an oiled ramekin or other small round baking dish that fits the four slices snugly, but in a single layer. (Or fit them close together on the baking sheet.) Spoon seedless tomato sauce on top of each piece just enough to cover. Grate Parmigiano Reggiano over the four slices to taste, but don’t overwhelm the dish. Add thinly sliced fresh basil. Top each eggplant round with slice of mozzarella (optional). Lightly dust with bit more Parmigiano Reggiano. Place in oven 1 to 2 minutes, until mozzarella is melted.